First, since this is a review of a Musical Traditions production, I should declare that it is of a bought copy, not a complementary one: my money is firmly where my mouth is. Next I must observe that this is not the sort of thing you can review while doing the washing up or jogging: you can’t listen to it and then jot down a few words. Nor can you read it on the bus or in the loo. Then, to save the reader skipping to the end, I should add that I have no regrets and that I would recommend that anyone interested in the history of morris should invest in a copy, even if, like me, they already have access one way or another to most of what is offered here. Why? Here is a Musical Traditions CD with no music apart from a short extract of Francis Shergold’s melodeon playing taken from the Veteran Greeny Up album. However, only a wag would suggest that morris is not a musical tradition and here is a mass of information relevant to the history not only of the dance but also of the music, or more particularly, the musicians. To borrow a usage from the author, it is largely a hagiography, telling us, in a series of greater and lesser papers, much about the lives of some of the men Cecil Sharp depended on, and the lives of their fathers and their fathers’ fathers, and how and why they did what they did in the context of the society of which they were part. 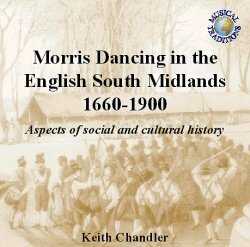 The core of this publication is the first reissue of Chandler’s complementary works first published in 1993, Ribbons, Bells and Squeaking Fiddles: the social history of morris dancing in the English South Midlands, 1660-1900 and Morris Dancing in the English South Midlands, 1660-1900: a chronological gazetteer (Folklore Society/Hisarlick). These works were widely reviewed when first published and the fact that this reissue has proved necessary indicates that demand remains while the supply of printed copies has long dried up. Both works have been updated. In the case of the first, Chandler claims the changes to be 'mainly cosmetic' with a little alteration of detail dependent on the changes to the second work which is in effect the database on which the first is based. There follows what is probably the most important work on the CD by dint of it’s being the first publication, Morris Dancing in the Forest of Dean, being in effect the results of Chandler’s extension of his Gazetteer research into that area back to 1576. Whether the Forest of Dean can be regarded as part of the English South Midlands, though, is a moot point that suggests that the overall title of this collection of works might not be the best available. Most of the remaining papers have been accessible before. There are six longer articles that have been published through Musical Traditions, either on paper or digitally, and eight that have mostly appeared in EFDSS or Morris Ring publications. Then there are five obituaries of important morris figures, a potted biography of the author and an impressive bibliography of his publications. The rationale for including the various longer and shorter articles seems to be that they have all been amended, rewritten or updated in some way as a result of further research. One cannot help admire the dedication that has refined so much data from endless documents, newspapers and records over so many years in so many local libraries and record offices. The Gazetteer was never going to be bedtime reading but is undoubtedly an important amassing of morris data. Ribbons, Bells etc. is equally undoubtedly one of the most important contributions to morris scholarship in recent years, the more so for being updated. Anyone who has engaged in family history research will recognise the problems and the part serendipity can play in such research: in the previously unpublished first of the short papers, Research and Serendipity, the author explains how this process can work and how new information can present itself even when all the obvious seams have been mined. This is why this publication is important, then. The original Gazetteer was but a snapshot in time of research in progress and the problem arises of how to present subsequent discoveries. Clearly each snippet could have been presented as a sort of interim report, but ideally should be, and has been, incorporated into the body of the work. We are told that we can expect further upgraded versions as time goes by. So, what of the format? The work is presented just as if you were viewing Musical Traditions pages and, as such, all is as clear as you would expect, and navigation is easy. The Gazetteer depends on a split-screen approach, which may present alignment problems to some, but these are unlikely to be insurmountable and guidance is given in the Note to users. But is a CD-ROM the best way to present the information? In my opinion, probably not, though it may be the cheapest and most efficient way to make it available. The Folklore Society has produced a second edition of Roy Judge's The Jack in the Green and in an ideal world, I would have liked to have seen a conventional second edition of Ribbons, Bells etc. and the Gazetteer, but of course already having the first edition might have prevented me investing much more than the cost of the CD-ROM in the second. Better a CD-ROM than no publication at all! Anyone who is involved with the publication of data with a permanent value (as this has) will have struggled for the last thirty years or so with a fundamental problem: whether the days of conventional ink on paper publication are over. As each technological innovation has come along, academic publishers and publishing societies have embraced them to greater or lesser extent, but who now has a microfiche reader or the means of reading those old floppies? Even NASA struggles to read data collected in the 1970s for want of the right equipment. The CD-ROM may already have seen its acme. So, buy the CD-ROM and produce your own paper version either printing direct or by copying the lot into your favourite word-processing package so that you can format it to suit yourself. Then you have the best of both worlds and can enjoy a good read on the bus or in the loo while listening to an appropriate collection of morris tunes. I do have a further problem though. It is the norm to give a page reference when referring to academic works such as these: it is helpful to your own reader and a courtesy to the author you are quoting. Is there a convention yet for reference to a book on a CD? For instance, I can cite Chandler, 1993, p. 188 'Although some men played in formal contexts etc' just like that. The best I can do for the same quote in the second, CD-ROM, edition is "Chandler, 2002, Chapter 9, Conclusion, line 1 et seq." I do not know the answer to this problem, but it is a problem.